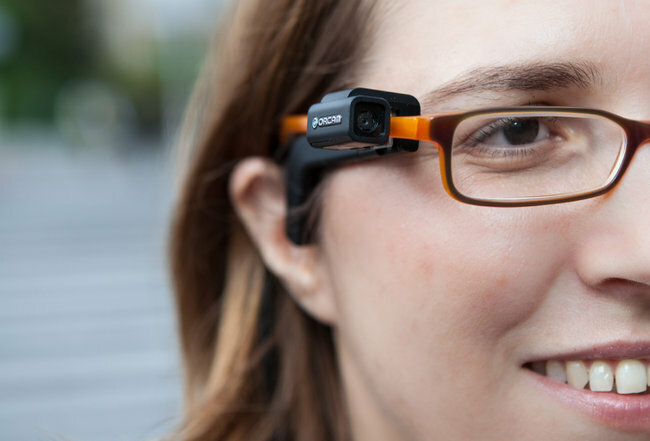 OrCam, an Israeli startup has come up with a amazing new product for the visually impaired. Up until now reading aids available in the markets for the visually impaired and the blind have been cumbersome devices that recognize text in restricted environments, or, more recently, have been software applications on smartphones that have limited capabilities. Here in lies the difference between the OrCam's new device. It would change the way the visually impaired see the world. OrCam device is a small camera worn in the style of Google Glass, connected by a thin cable to a portable computer designed to fit in the wearer’s pocket. The system clips on to the wearer’s glasses with a small magnet and uses a bone-conduction speaker to offer clear speech as it reads aloud the words or object pointed to by the user. So the visually as shown in the image the visually impaired have to just look at the article like a can of vegetables and the camera will get into action, reading the label, price etc. using the simple and unobstrusive camera in to ear of the wearer. The Israeli start-up that has developed a camera-based system intended to give the visually impaired the ability to both “read” easily and move freely which it does very beautifully. The system is designed to both recognize and speak “text in the wild,” a term used to describe newspaper articles as well as bus numbers, and objects as diverse as landmarks, traffic lights and the faces of friends. Right now it supports only English language and is available for a promo price on the company’s Web site for $2,500(Rs.137500.00). which roughly amounts to the cost of a midrange hearing aid. Do visit the website for peep. But as I said earlier, awards, rewards and recognition from the world Governments could make this one a cheaper and more accessible device. +one from me for the makers of this marvellous piece of engineering. This news including the image above has been sourced from New York Times. This is amazing. This can go a long way if the company gets help from the governments.